Introduction: Neurofibromatosis type 1 (NF1) is a common Mendelian multi-system disorder that is characterized by café-au-lait spots (CLS), axillary freckling, optic glioma and plexiform neurofibroma. Various mutations of the NF1 gene are widely accepted to be the main cause of this disease, while whether there are still certain other modifier genes that could influence the phenotypes of NF1 is our concern. 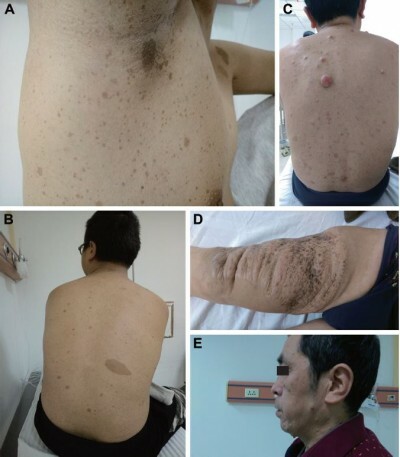 Patients and Methods: One proband and his father are involved, who are characterized by plexiform neurofibroma and cutaneous neurofibroma, respectively. Enhanced Computed tomography (CT) and Positron emission tomography-CT (PET-CT) were taken to collect the radiographic data, and the specimens of this neurofibroma as well as the blood samples from the father and son were sent for panel mutation screening of 295 tumor-related genes based on next-generation screening. Furthermore, the NF1 gene mutations were referred with Canis lupus familiaris, Rattus norvegicus, Gallus gallus, Danio rerio, and Drosophila melanogaster NF1 sequencing for evolutionary conservativeness and then analyzed in Condel databases for pathogenicity prediction. Results: The radiography indicated that the benign plexiform neurofibroma only occurred in the son. Also, TP53, FANCA, BCL6, PIK3C2G, RNF43, FGFR4, FLT3, ERBB2, PAK7, NSD1, MEN1 and TSC1 were uniquely found mutated in the son, which could be candidates as new modifier genes; besides, RNF43 was also mutated in public neurofibroma seuquencing data. By KEGG pathway annotation, phosphoinositide-3-kinase-Akt pathway was altered in both the public plexiform neurofibroma sample and in our proband patient. Conclusion: This study reexamined the background germline mutations and suggested their potential value as modifier genes that may influence the phenotype heterogenity.